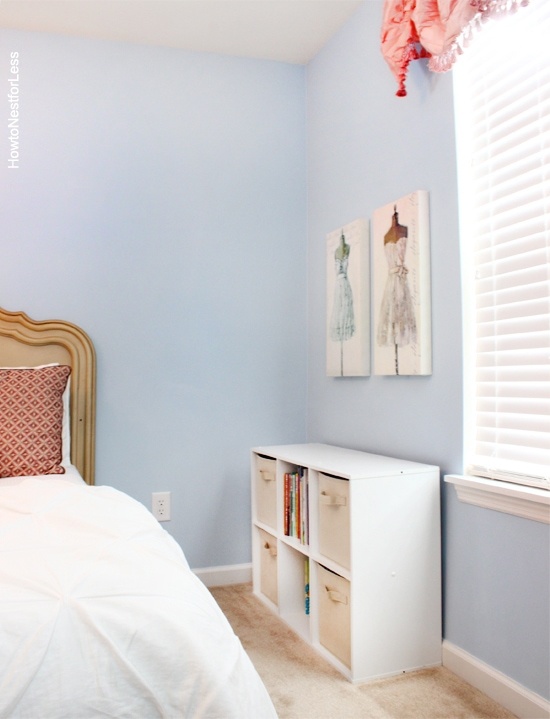 Well, I have one room marked off my list in the new house… my daughter’s bedroom! When we were building this home by daughter had a couple requests for her new space… blue walls and a fancy chandelier. Oh, and did I mention the little rockstar requested a stage? Yep, her bedroom stage is now complete with curtains and glittery stars. The perfect place to play her guitar or set up her karaoke machine so she can rock out to the Frozen soundtrack. And the gold curtains go perfectly with her antique white furniture that she’s had since a baby. Love the shape of these pieces. 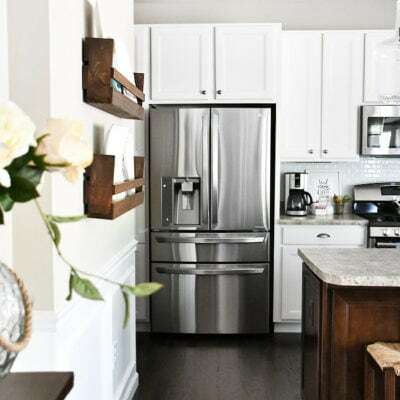 And most things were recycled from her old bedroom to save money in the new house… the flowered lamp, her white bedding, accent pillows from my old bedroom, and pictures that used to hang in our master bath. The chandelier we found on sale from Lowe’s and all of the pink valances were on clearance at Bed, Bath and Beyond for $20. 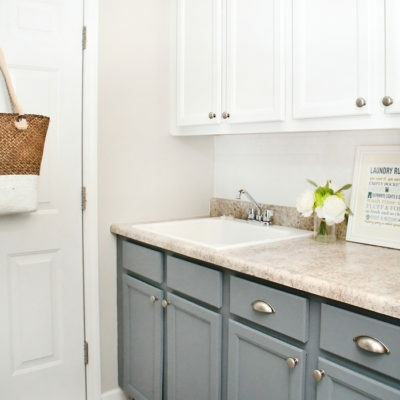 The paint color is Poetic Prose from Clark+Kensington at Ace Hardware. And the white chenille back rests are from Walmart. $16 a piece. Yep, bargain shopper here. And they’re great for sitting back while watching our little lady perform sold out shows in her bedroom. While my daughter has a large walk in closet to keep most of her toys, this little white organizer from Target holds her books, American Girl doll clothes, Barbies, and little play figurines. It feels pretty good to have a room crossed off my to-do list, even if it’s not something that I necessarily use everyday. But I wanted this house to feel like her home. And trust me, it worked. 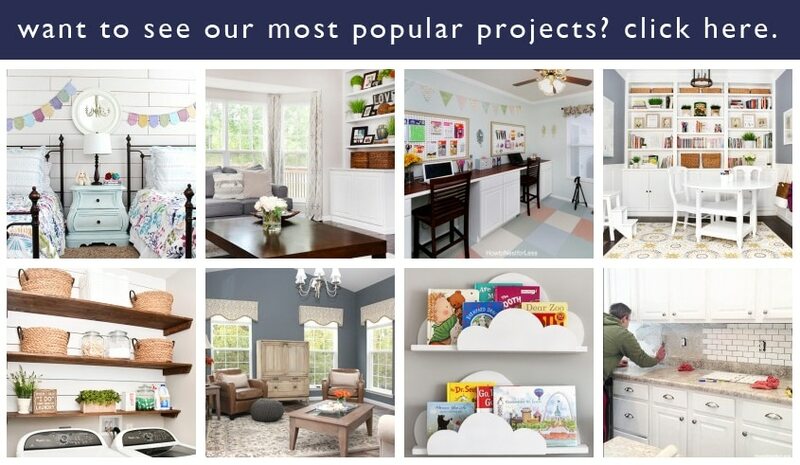 Stay tuned for more posts this week about her bedroom makeover, including how we actually completed the stage and some additional behind-the-scenes projects! What a beautiful room! 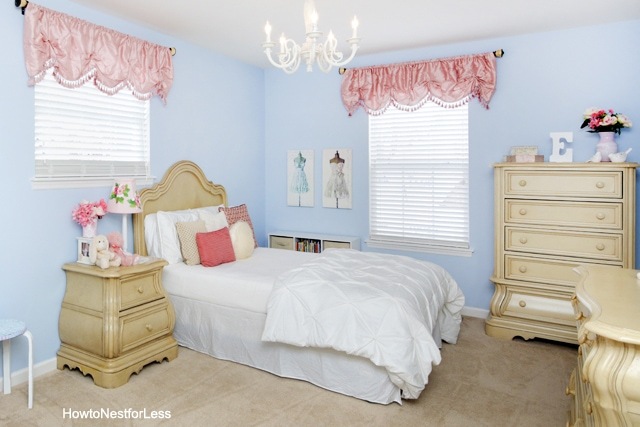 Love the valances along with the other just right touches of pink. You have a lucky little performer! It is absolutely beautiful! I love each and every little part of it, especially that you were able to re-use so much! Great job! Thanks Carol! 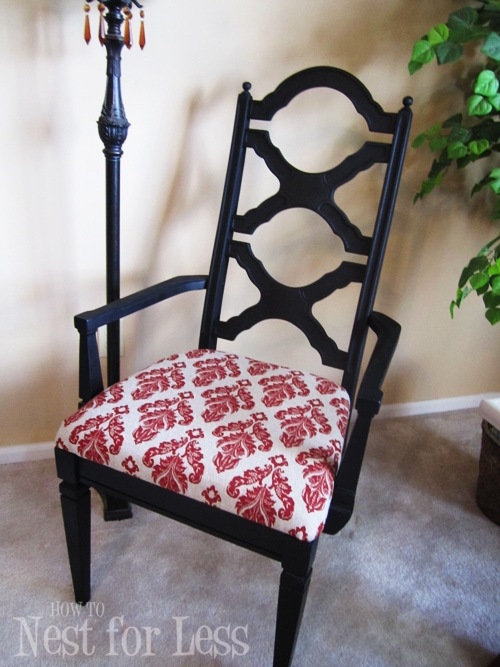 Yes, love repurposing in makeovers. Definitely helps save some cash! Love it! 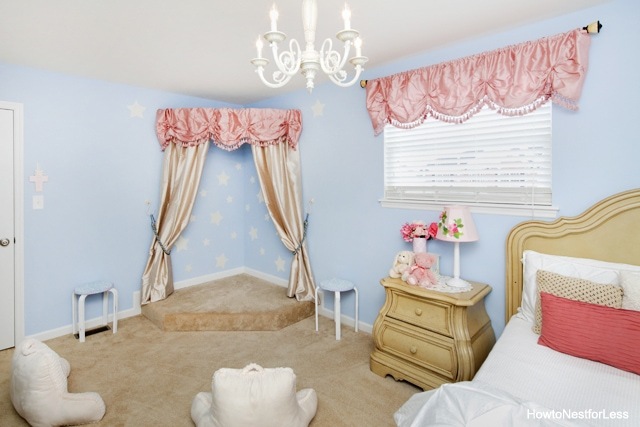 It’s every little girl’s dream bedroom. 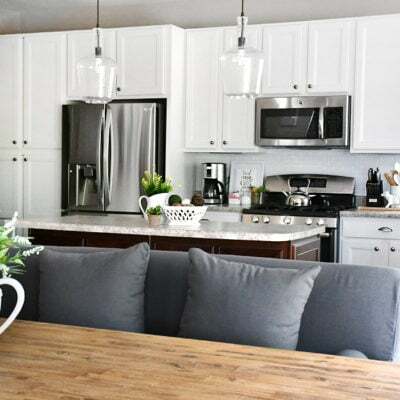 You’re going to have the most popular house for sleep-overs with that stage! Beautiful job!! The rockstar stage is AWESOME!!! Beautiful! I did a similar treatment to my daughters room. 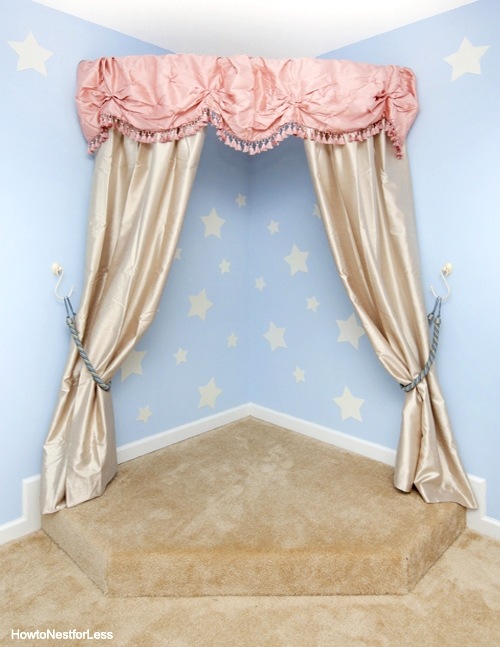 I was doing a princess theme and used a curved shower curtain above her bed to create a canopy. Then painted silhouettes of Cinderella’s castle, and a cameo in the center behind the bed. Turned out really cute! But they grow up too fast and it didn’t last long where I had to paint over it! BEAUTIFUL!! When is the first concert? 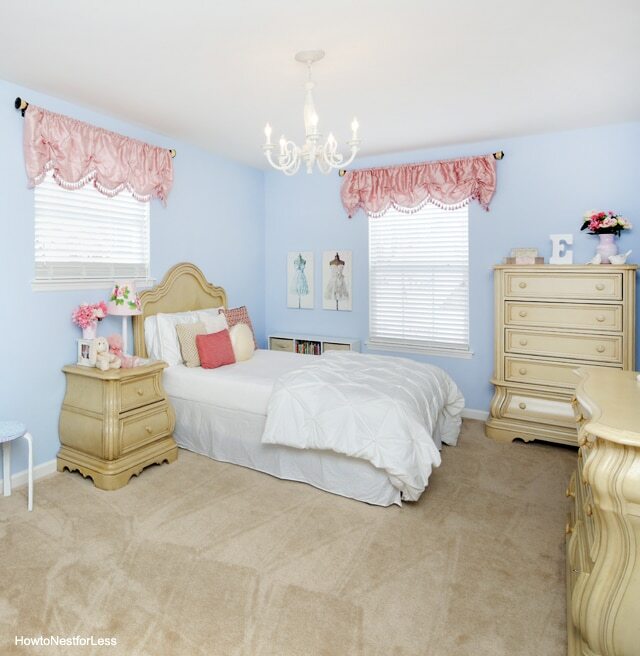 Such a sweet room for your little one! I love the state and would love for you to share at Fridays Unfolded! What a cute room! Found you over at Serenity Now. Love the colors. OMG! She has a stage! I would have loved this when I was little, I love it now! Gorgeous! 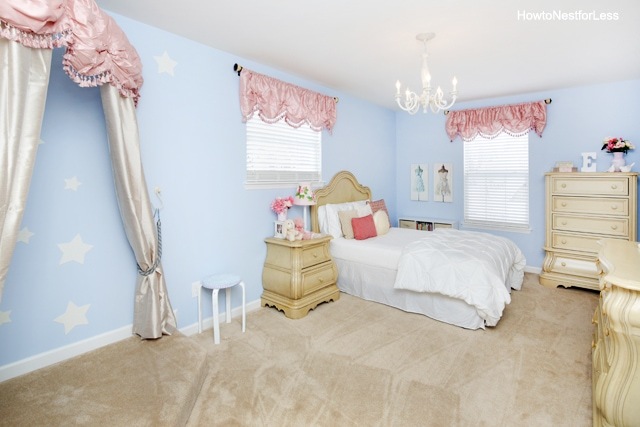 I have exactly this color carpet to work with and was looking at color ideas for my (hopefully) new adopted daughter’s bedroom. Her only request is “not all white or beige with more than one pillow and a warm blanket on my bed,” which gives me a lot of creative leeway. I figure we will end up redoing the room in a couple years anyway but this room looks so welcoming and comfortable, like a good place for a little girl to dream. Since it hits all the right notes, I am using it for my inspiration and color palette. I’m sure she will be delighted. Aww, good luck to you! I’m sure she’s going to love it! !